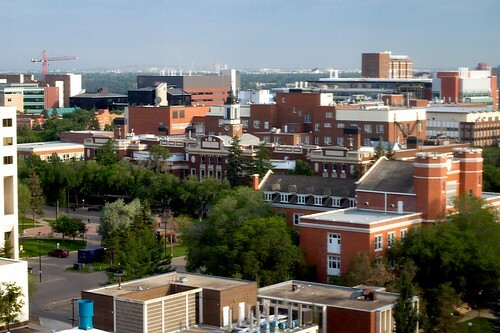 Yesterday I was on stage as the opening act for the 2010 Canadian eLearning Conference hosted at the University of Alberta, with a new show I had conjured “Join the Secret Revolution”. The presentation is on slideshare (where you can see the notes for the slides); I have an audio recording but it is trapped on my iPhone and need some time to transfer it over. and is also included in the slideshare below. View more presentations from Alan Levine. The idea was spawned by the rEvolution theme of the conference, and I thought I could have some fun looking at ways one could take on what seems like huge challenges (“We Must Change Education!”) and not be flaming radicals (“Burn the mother down” through smaller scale actions in what we do as people who work inside such institutions. I had set up a web site for the “home of the revolution” http://secretrevolution.us which is not US in the USA sense, but as in “the revolution is us”. I had dreams of ramping it up in the spring as a big campaign, and had elaborate undoable ideas for secret challenges and clues, but time ate my ideas. I had some fun in the presentation by introducing my own critical questioner as my “Inner Geek”- I had slides that played an audio of my Mac’s speech to text (Alex voice) countering what I was saying. My plan was to talk first about the ways we should not feel bounded or limited by the technology tools at hands- it’s easy to yell “PowerPoint is Evil” or “The CMS is a tyrant” but technologies do not inflict their will on us- a person is responsible for every bad powerpoint, and sa technologies they ought to be seem more as just containers- the challenge on us is to does omething with the containers, or look at the “sideways” and get creative on how we can do things with them that are useful, and likely, not how they were intended to be used by their creators. I led with an old story of a project at Maricopa in 1995 where we had faculty look at commercial games and shared some of the clever ideas people had for using, say Myst. I have not even seen the inside of a Course Management System since the early 2000s but I had hoped to find ways people were doing unusual things inside there– but did not come up with much beyond the ways some have deployed widgets and embedded RSS (using my old Feed2JS or Tony Hirst’s approach of using frames or browser scripts to add content to Moodle). But I was glad when Bob from University of Alberta described some of the games and role plays he has worked on with colleagued here that play out in a WebCT discussion board. There was a story someone shared of how a funded Second Life project had faltered because they could not get the University to install the software in the labs, so the end around was working out how to run it via portable apps on USB drives. I then pulled a few examples of the things people do creatively to use outside technologies on the inside, some clever ideas for using YouTube asking students to annotate content to describe a chemical process, Dean Shareski’s experimemnt with just trying yammer as an experiment. You can find all of the examples and more at http://secretrevolution.us/links/. The problem I was facing as I was working the final slides this week was… so what? I did not have a real closing point or message here; this is stuff I bet most everyone in the conference room is doing to some degree. And then I found it (well I thought so). We all might be working at this from many degrees of intensity, from first experimentation to full blown edupunk- but what we can all do, and should do, is to continually try to “turn up the heat” of what we do, do not just stay on the same level, but keep experimenting, trying, extending our ideas and taking on new challenges. And the other key part is; you cannot be part of the revolution (well I made it up so I can make the rules) if you are not sharing it somehow in an open way. The presentation looks great, and judging from the reactions I saw on Twitter, you opened up some minds and got some important concepts across. Kudos! I think I get your point. But it is possible to make legitimate critiques of technologies, on the grounds that their features strongly influence certain practices. An assertion like this one is a little too close to “it’s all good” for my comfort. Choosing a bicycle or a Hummer as your primary means of transportation is going to have effects. Of course, you can use a bike to smuggle biological weapons, or use a Hummer to transport food to homeless shelters. But the the characteristics of these technologies are not changed, and it is still possible to make distinctions. And when a society chooses to orient itself around the needs/effects of cyclists or those of SUV drivers, the implications cascade quite widely. Similarly, the people you spoke with in Edmonton will make decisions on which technologies to support that will go beyond how some creative people will make the best of what they have. I know good work can be done in an LMS. I work in a unit where great courses are developed every day using this technology, and I have nothing but respect for the people who do that work. But does that mean that the technology they are expected to use is irrelevant? There’s a reason for that. Because the great work that gets done is not accessible, and that is a feature of the technology and the mindset that surrounds its use. Having teaching, learning and research activity happening in isolation (despite taking place on a network that should promote connection on an unprecedented scale) is very much a result of the technology choices we make. Just like urban sprawl, global warming, oil spills and perpetual war in the Middle East are results of favoring the automobile as our mode of transportation. I applaud you telling people they can make a difference with the tools they have on hand, that even if they are not the ones calling the shots they can find a way to do great things. I bet that inspiring message resonated with people in the audience. But that doesn’t mean that those of us in a position to make judgments and have our voices heard should not make the case when we have the chance. If we had more openness happening in the world of LMS-supported practice, I would have to revise my view. But I fear that the ‘secret’ nature of too much educational work means that the revolution we need will never happen. Viva el perro! Viva la revoluciÃ³n! I hear ya, and accept that going middle of the road is not always doing much. The piece I was hoping for is that as creative human being,s we are not at the will or mercy of technology. At the same time, we ought not to just cave in to any tool, and have to accept that choices of these tools have consequences. Good foor for thought, amigo. The Revolution can be recast.